I feel an apology is necessary. I was pretty rough on the Rah last week. 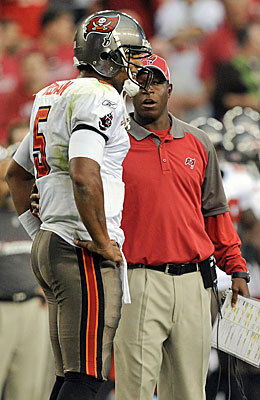 For those of you who don’t know, Raheem Morris is the second-year head coach of the Tampa Bay Buccaneers. Last season, his team went 3-13. This season, they’re 5-2. Surprising isn’t a strong enough word. Between work and the NFL’s blackout policy, I haven’t had the opportunity to watch much Bucs football this season. The first game I watched in its entirety, in fact, was last week against the Rams, a game which they won, but sloppily. After that win, in his post-game press conference, a confident Morris told reporters his was the best team in the NFC. Most who heard those comments, including myself, found them laughable. I wrote a somewhat critical blurb calling anyone who thought Tampa was that good either delirious or extremely uninformed. As it turns out, I’m the one who’s uninformed. For that, I must apologize. I pointed out that the Buccaneers ranked near the bottom of the league in several key categories but as Rah reminded us last week, ‘stats are for losers.’ The only stat that matters is the number in that W column and right now, the Bucs are adding to that number on a weekly basis. Who would ever have guessed Rah was the smartest man in the room? In all fairness, the Bucs have had an easy schedule. The five teams they’ve beaten are a combined 12-24 while the two teams to whom they’ve lost, Pittsburgh and New Orleans, are 10-5 and your last two Super Bowl Champions. But wins in the NFL are tough to come by. Just ask the Dallas Cowboys. The bottom line is the 34-year old Morris has the men in his locker room playing their hearts out. Behind the steady play of the quarterback of his dreams, Josh Freeman, and a steal of a waiver wire pick-up in LeGarrette Blount, the Bucs are the second youngest team in the league. They may be inexperienced but they are…. somebody. Looking at their remaining schedule, a playoff spot might not be as far-fetched as originally thought. Did I really just say that? The Bucs have four home games left, three against Seattle, Detroit and Carolina, all perfectly winnable. Their five remaining road games are against Atlanta, San Francisco, Baltimore, Washington and New Orleans. Their two games against Atlanta, including one up there this weekend, will be huge. So tune in, Bucs fans, and root hard. With one loss already to New Orleans, it’s unlikely the Bucs will win their division, meaning they might need to shoot for a wild card spot, but how many wins will that take? Ten? Nine? Eight? Any way you slice it, they’re half way there and a playoff spot, once thought ridiculous is now in sight. So once again, coach, I apologize. You’ve made a believer out of me and many more in this community. This entry was posted in Featured, Life of Sports Chump, Pigskin and tagged Atlanta Falcons, Josh Freeman, NFL, Poker Table, Raheem Morris, Tampa Bay Buccaneers by Chris Humpherys. Bookmark the permalink. Stats are losers …… LOL,LOL ,LOL !!! Obama and Pelosi still have faith that the Dems can stem the tide of discontent and come 2012 they’ll regain power. The fact that the midterms was a bloodbath for them merely proved nothing at all . So how can one fault Rah ? We’ll know more about the Bucs in this upcoming game against the Falcons and how it augurs for the rest of the season . Radio Raheem is exceeding everyone’s expectations this season…even his own. I don’t even think he thought TB would be 5-2. The Bucs are 5-2 and SD is 3-5. Is 11:30 a.m. too early to start drinking? Forgive for saying this but even though Pierce is a certain Hall of Famer he’s now not even the best player on that Celtics’ team . They’ll only go so far as Rondo can take them . Kid’s dishing more assists than in four games than the likes of Telfair has dished in a season . Rumor has it that Marbury feels that he’s not the real deal and that were playing the point for the Celtics they’d be unbeaten . So how’d you now feel ’bout the Red Sox owning an English soccer team in the Premiership league in the UK ? They bought Liverpool FC from Tom Hicks who use to own the Rangers , Dallas Stars and the soccer team ? It’s true stats don’t mean much, just look at the Chargers offensive and defensive stats, they should b 7-0 right now based on them alone! No matter if they make the playoffs or not they are definitely heading in the right direction faster than I thought they would! Pistons’ player Charlie Villaneuva is ticked off that allegedly Garnett says he’s ….”a cancer to his team ” ? Personally I think he got off lightly ……. have you seen how bad the Pistons are ? God-damn were they a lame race horse I’d put that bi_ch down ! I was actually surprised to see that Bucs-Falcons line set at 8.5 but I guess Las Vegas, as usual, knows what they’re talking about. For the record, I heard your boy Mark Schlereth predict the Buccaneers will be the Denver Broncos of last year. Start off hot and fade down the stretch. After looking at the standings, I’d say the Bucs need to pay close attention to either the NFC East or West for competing Wild Card teams. But three of those last four home games are perfectly winnable. Let’s see if this young team can execute down the stretch so Schlereth can eat some crow. Dirty South style! Does Norv make it past this season if the Chargers don’t win at least one playoff game? I’m just as shocked as anyone else about Rondo’s success in the NBA, Al. I never saw that coming. For your stat-mongers (not Rah, obviously), the NBA record for assists in a single season is held by none other than John Stockton with 1164. Over an 82-game season, that’s an average of 14.2 assists per game. We’ll see how close Rondo can come to that but I don’t see it. Rondo’s the spark that keeps that team going but there’s no denying Pierce’s contribution to the league over time. I don’t think much about sports owners branching out to own other teams. They’re investors so if they feel they find a good investment, go for it. That’s the Chargers’ window of opportunity slamming shut. I actually thought Villanueva would become a serviceable NBA forward, a solid 12-8 guy. He has yet to average 8 rebounds a season since getting into the league!! How is that even possible? But is it any surprise that we’ve covered up what Garnett ACTUALLY said just like we’re covering up what Favre actually did with that cell-phone? The first time Morris impressed me is when he took over the defense and improved it dramatically. The offense is working, but I think the defense still needs work. It’s true they’re young and may not go far, but I’m having more fun watching them than I thought I would. You know what a big football fan I am, but the telling stat that I heard about the Bucs was that they’ve given up more points than they’ve scored. Regardless of the sport, it means that you are an outlier on the bell curve and will be reeled back soon enough. I suppose the whole NFC could end up scoring fewer than they give up and the Bucs are just the least rotten egg, but I doubt it. Nobody expected anything out of this team. Look, I know it was only the Arizona Cardinals last week but the Bucs looked damn good. And their defense played spectacular. Nothing like a few pick sixes to put points up on that scoreboard. I guess the only question left to ask is…. are we believers this weekend (take the 8.5) or not (lay ’em). I looked at that stat and even mentioned it last week, Unc. They’re currently -27 in scoring which means they’ve squeaked by the teams they’ve beaten and gotten mauled by the team they lost to. I also thought that would catch up with them. It might. It might not. The Bucs are fortunate a few NFC teams this year (Dallas, Minnesota) have combusted. Look, nobody here thinks this team is Super Bowl bound but under a second year coach, essentially a rookie quarterback and a pretty inexperienced team, 5-2 is still pretty damn good. A lot of people are pointing to this Saturday against the Falcons. Will they win, will they keep it close, will they get blown out? The Falcons are GOOD and there are no moral victories in the NFL. We’ll see on Sunday at around 4:15 pm EST if I backtrack on my words once again. Chris thank you for this. 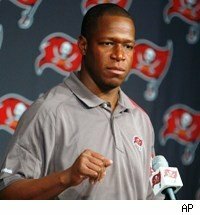 You know how I have felt about my Bucs! For the record I believe after they cut Keydrick Vincent they are now the youngest team in the league but yes stats are for losers! As much as I am more and more impressed with Rah, don’t forget about Mark Dominik. Freeman is looking more and more like the best of the three QB’s drafted last year. Mike Williams in the 4th was a steal to put it mildly as was Stroughter in the 7th. Geno Hayes and Grimm, both 7th rounders look pretty solid so far as well. Blount as you alluded to was a great pick up. Price, Miller and McCoy have yet to shine but the potential is there and we got a good taste of what Benn is capable of last week when the game was on the line. In short the Bucs are loaded with young talent and appear to be on the right track for the next few years. If they can pick up a good pass rushing end and get a Middle Linebacker more in the size range (if not the talent range) of an Uhrlacher or Lewis that would go a long way toward solidifying the run D. Best part is they have done all this without their second best Defender Tjack, who is likely done as a buc, and Winslow has not been himself. Vegas has picked against the Bucs every week except the Rams game so the spread doesn’t bother me. As long as Free is in the game, so are the Bucs. Not sure if they win this week, but since most “experts” picked them to win 2-3 games, you are not the only one who owes Rah an apology! Peter King, BITE ME! I’m not sure their window is shut with Rivers at the helm for the next five years, but I sure hope it is! And there goes another ecstatic Buccaneers fan. Always eager to please, Mr. K.
And Peter King, SportsChump.net is not always responsible for the comments of its readers. Sethy…. if you’re still coming up and have an extra ducket, I believe you know who to call. LT is sleeping easy these days. Here’s another case where I’ve been swept up following the local team. Being a Gruden fan I’ve been very skeptical of Raheem Morris but it appears he’s cleared perhaps the biggest hurdle with his young players, he has their confidence. That plus talent means good things happen. If enough of those good things (wins) happen then the next big hurdle is cleared, the young players who have bought in on their coach now start to believe anything’s possible. With that hurdle behind them, the sky’s the limit! Now, reality will set in this season, but the fact that those hurdles have been cleared, plus an off-season when a couple more pieces are added to the puzzle, a linebacker here, a return man there, another year of experience and the NFC South could become the strongest division in the NFL! Rah Rah’s got my vote for Congress as I feel that we need one or two more comedians up there in DC ! As for Villaneuva and Garnett let ’em throw down and that’ll sort out the men from the boys rather than them merely chest bumping as if they can actually fight ? Bucs Falcons should be a good game . It’ll either be a close run thing or they’ll get blown completely out of the water ! And for God’s sake can McCoy make at least one tackle a game or pressurize the opposing qb rather than stumbling around like a damn headless chicken ! The Bucs are spending $36 million on the guy and he’s saying that he’s still has some difficulty learning the game . What the hell was he doing in Oklahoma …. needlepoint ? Once the Bucs’ defense and offense really acclimatize themselves then we’ll see how good they can become. But as of now Rah should just let the guys find their way rather than making the sound bytes that could come back and embarrass himself and the team as a whole ! Titans’ owner Bud Adams is breathing a sigh of relief because he’s just found out that Moss isn’t anti Semitic . Makes a change given Bud’s proclivities as it concerns women and minorities . LOL,LOL,LOL !!! It’s not early to suggest that both Childress and Phillips should have sandwich boards hanging around their shoulders with a sign saying … ‘Will work for food ‘ ? Despite his name recognition, the only way Rah’s getting voted into office is if he runs on the Republican ticket. The First Take boys also suggested a Garnett-Villanueva grudge match. Personally, I’ll all about the love. This too shall pass. McCoy’ll come around, Al. He’s a rook. And although I’ll be working this Sunday, I’ll still be glued to the set from 1 to 4. I’m telling you, Al. I know Rah says stats are for losers but, other than looking at the final score of these ball games, it’s tough to figure out how the hell they’re doing it by simply looking at the stat sheet. I’ll have my Clue-less piece on Childress, Phillips, Childress and Lewis coming up soon. Take pity on Rah as there’s not too many ‘bruthas’ going out of their way to profess their love for Republicans or Tea Party . That’s not to say that they’re misguided but you go with what you know ! Would there be a welcome mat for the likes of Jesse or Al Sharpton were they to switch sides ? Only if they can bring more votes, Al. Heres a stat that is a big reason why the Bucs are winning. They lead the league in iterceptions. Another stat is that Freemen has thrown three in 7 games and two were tipped. They are winning the battle of the turnovers and in many cases TOP. I’m not saying the Bucs will win but the last time they met the durty birds the birds won on the last play of the game. It’s still the NFL and anything can happen. Bucs have not lost on the road since the Dolphins beat them in Miami and again it was on the last play of the game. I was there and it was painful to watch! McCoy may not be getting his name called but he is often getting double teamed so he is contributing. If the Bucs had a real pass rusher (no offense to Stylez G.) you would hear his name called more. On another note if Rondo didn’t make a believer out of you his first year, when will he? Dude is the best defensive PG in the league along with the mad assist skills and he always seems to be able to get to the hole when the shamrocks need it most. Hey Al, do us all a favor and stick to sports. Everywhere knows politicsa is taboo. The turnover margin is a big one in football that generally translates into victories. And trust me, I’m a believer in Rondo, man. I’m just saying that, having watched him in college, I NEVER expected him to become the player he is now.